Although it is difficult to specify the exact date when the Iowa Psychopathic Hospital began, a university committee recommended the creation of a psychopathic institute to investigate the nature, cause, and treatment of mental disease as early as 1910. 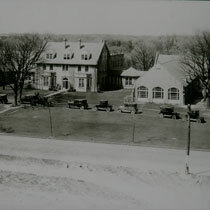 The General Assembly appropriated funds to build the Iowa Psychopathic Hospital in 1919 and construction began soon after. The hospital functioned from an annex of the main university hospital until construction was completed in 1921. This is thought to be the first university affiliated psychiatric department west of the Mississippi. The General Assembly clearly viewed the mission of the Iowa Psychopathic Hospital as distinct from the work of the four existing state hospitals for the insane (the first was Mt. Pleasant in 1861) and the two state hospitals for mentally defective and epileptic patients. 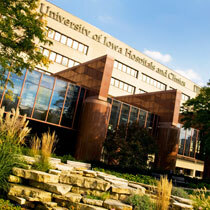 Although many things have changed in the Iowa Psychopathic Hospital since 1920, including additions to the building for psychiatric research in 1962 and the Children’s Psychiatric Hospital in 1963, becoming a part of University of Iowa Hospitals and Clinics in 1976, and the move to the Pappajohn Pavilion in the main university hospital in 1991, the department has never lost its focus and commitment to the primary missions given by the General Assembly in 1919. Then: Medicine and the medieval architectural image were closely associated in the teens and on through the 1920s. This complex of low buildings (one to two and half stories) has the feeling of a Tudor Revival university dormitory rather than a hospital. The brick and sandstone trim building seems to meander informally over its site. The late medieval details—pointed arched openings; tall, narrow chimneys; step roofs with dormers—together with its well-landscaped site, pose a fine example of the early 1920s Tudor Revival. Now: The current location of our clinical services is on the first two floors of the John Pappajohn Pavilion. The Pappajohn Pavilion was designed by Hansen Lind Meyer Architects. 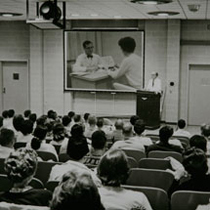 Then: The department offered three courses to medical students and five courses to resident physicians. 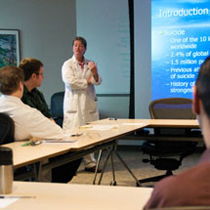 The department devoted 140 hours to medical students and 90 hours to graduate students. Now: The department devotes 2,000 hours to medical students and 500 hours of didactic teaching to resident physicians not including teaching during patient care. 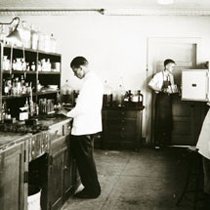 Then: The first funded research project was conducted by Samuel Orton, MD, director of the Iowa Psychiatric Hospital. 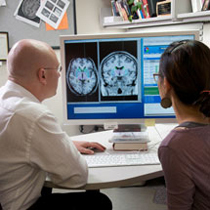 Orton received a $60,000 grant from the Rockefeller Foundation to study the changes in cerebral physiology associated with educational disabilities in reading, writing, and speech. Now: The department is ranked #19 in National Institutes of Health (NIH) research funding and has over 65 research initiatives in progress. Then: There were 19 publications by faculty members. Now: The department publishes over 150 scientific papers annually. 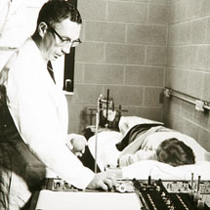 Then: There were six physician faculty members and five resident physicians who cared for 108 men and 96 women. There were 42 patients under age 20 and 157 with a first episode of mental illness. The average length of stay was 74 days and 27 patients were discharged to State Hospitals for the Insane. Now: There are over 80 full-time faculty members and 40 resident physicians enrolled in training programs in adult psychiatry, child and adolescent psychiatry, family medicine-psychiatry, internal medicine-psychiatry, and geriatric psychiatry. We admit about 2,200 patients and schedule 31,000 clinic visits each year. Then: We had two services -- inpatient and outpatient. Now: We have 11 distinct programs ranging from our assertive community treatment program (IMPACT) to the partial hospital program, to telepsychiatry, to employee assistance, to outreach services at the Community Mental Health Center for Mid-Eastern Iowa, to psychiatric care in some of the nursing homes surrounding Iowa City.